This is a summary of an article written by Lingoport’s Adam Asnes for the Oct./Nov. issue of Multilingual Magazine. For the full article, see the link below. 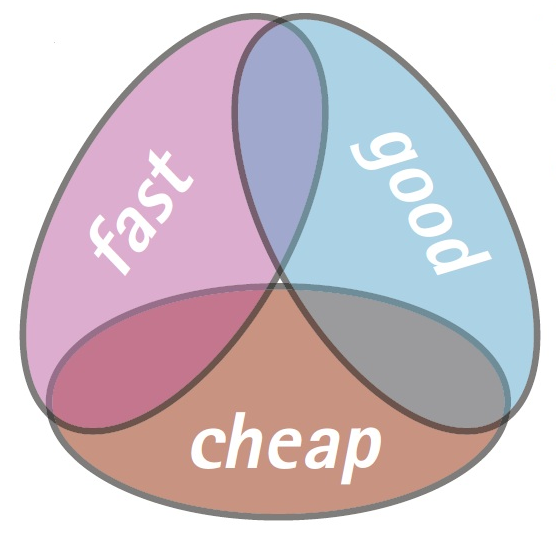 The good, fast or cheap (pick any two) triangle has been a topic for localization project managers since the charge towards new markets has become highly competitive. When looking at the barriers to entry into new markets, project managers have been investigating ways to shrink the triangle, so that good, fast and cheap can synchronize into one. First off, businesses are looking to keep up with the speed of the world today by being the first to enter into a market or the first to publish a story. Or as the great Will Ferrell once said as Ricky Bobby in Talladega Nights, “If you’re not first, you’re last.” Secondly, the issue of good is often not even an issue for most businesses; it is expected and it must be proven. Lastly, cheap is often synonymous with poor quality. For this reason, buyers don’t want the cheap option, rather they settle for the good enough option. Lingoport recently posed this question on LinkedIn discussion boards and got a passionate response from leading vendors and customers in the localization industry. This inspired a virtual roundtable webinar with localization professionals from the translation-side, localization vendor-side, internationalization-side, content development-side, tools and technology-side, as well as from the customer-side shared their view on how to potentially shrink the triangle.